2012 Wuhan To Ohio Summer Program: Welcome! We received two wonderful gifts from China (notice the lovely and lucky red) to wear for our renewal of vows ceremony held June 9 here in Columbus, Ohio. 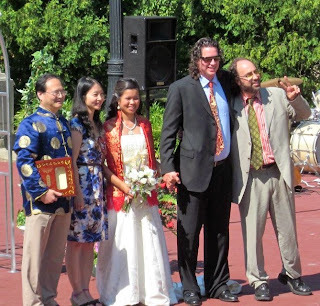 Left to right are Minru Li, Ming Fang, Irene, myself, and Bob Eckhart. First and foremost, WELCOME, students and friends from China! We are very excited to meet all of you very soon. We hope to make your time in the United States as educational and enjoyable as possible, and our goal always is to build bridges between our two cultures through education, communication both written and spoken, friendship, and travel. My name is Mike Lohre, and I am the Manager of the WTOSP. Wuhan and its people and students are very dear to me. I taught two summers in Wuhan, and have managed this program since 2009. I'm lucky to work with great people and soon you'll meet program assistants and our friends Rick Sentieri, Hans Li, and Ming Fang, as well as many others. I was raised on a family farm in Minnesota and we raised pigs, sheep, cattle, corn, beans, oats, alfalfa and chickens. I was the first in my family to graduate from college and I studied Journalism. I later was a Journalist but I also worked as a Warehouse manager, salesman, pipeline leak fixer, road construction worker, grain bin builder and many other odd jobs. I started teaching in earnest after I got my Masters Degree at age 30, and I have now taught English at Ohio State for 16 years. 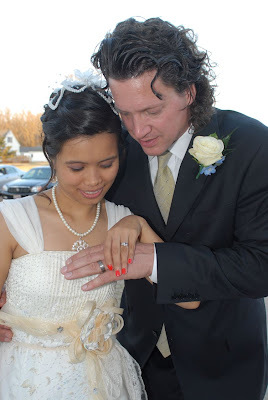 I just got married on March 17, 2012, and you will meet my wife Irene very soon as she will join us for events in Ohio and go on the East Coast trip. The event I am really looking forward to this year is the East Coast bus trip. For one, I like being on the bus and we have a wonderful lady who drives for us named Vernia. She has become a good friend and you will like her! But the reason I really look forward to the trip this year is because it's such a wonderful learning experience and opportunity. Travel teaches us so much, and it's fun! I'm also happy that my wife can join us as Irene is originally from The Philippines and this will also be her first time to see these places. Okay, that is plenty for now. This blog allows us to write, post pictures, create links to research and ideas, and even share videos or video reflections and interviews. We'll learn how to use this blog once everyone arrives and there will be entries on the blog to help you. For now, look for informational posts and introductions here. Welcome to the Wuhan To Ohio Summer Program 2012! Irene and I on our wedding day, March 17, 2012.